The Vacationers Cafe is a travel-themed cafe. It is beautifully set up with a world map at the entrance which doubles up as a dart board. My favourite corner is the one with a boat sitting pretty with the rows. The cafe offers indoor as well as outdoor seating. The staff is polite and the service is quick. 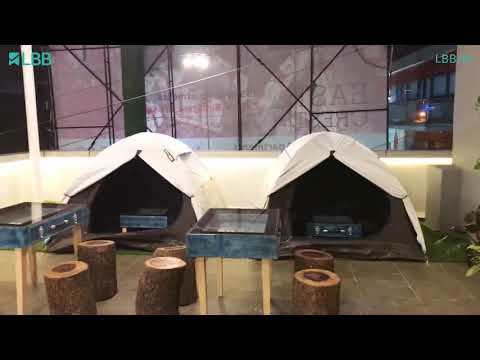 Placed in the outdoor section are some quirky bark-like seats and cute camping tents. The setup would surely excite the traveller within every visitor here. The cafe serves sumptuous quick bites, do try their crispy honey chilli potatoes, burgers, and pizzas. Oh, and the desserts are a must-try here. If you love reading, check out their Travelpedia section. It's a great place to hang out and chill with your friends. The rooftop is sometimes noisy due to traffic in the area. Big Group, Bae, Family, and Kids.